Michael C. Hall knows an immensely talented filmmaker when he sees one. Once word broke that the Emmy-nominated actor’s tenure on Showtime’s eight-seasons-deep series Dexter was ending last year, he no doubt could have given any director in Hollywood a call and broke bread. Regardless of your opinions about Dexter’s final seasons, there’s no denying that Hall, playing the morally guided serial killer Dexter Morgan, consistently gave towering performances, anchoring the uneven show with a dexterous mix of muted vulnerability and primal explosiveness. And since Dexter was about to wrap up, Hall’s considerable talents were available for any and all interested producers and directors to acquire. For his first post-Dexter role, though, Hall didn’t go for the big bucks or major-studio prestige. He went indie, but not just your typical lo-fi independent film—he aligned himself with one of the best young horror filmmakers out there. 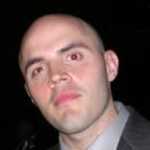 Prior to teaming up with Michael C. Hall, Jim Mickle was already many horror bloggers and critics' new favorite auteur. His films have something extra to them, an almost Terence-Malick-like air of elegance and restraint that’s atypical for the scare genre. Mickle, along with his regular writing partner, Nick Damici, debuted in 2006 with Mulberry Street, a riff on the classic George A. Romero zombie movie construct about people getting bitten by infected rodents and turning into flesh-eating rat people—made on the cheap but sharp in wit and energy, it’s a cut above most DIY horror fare. Mickle’s skills improved dramatically, however, with Stake Land, a post-apocalyptic vampire western that’s as violent and disturbing as it is mature and artistic. Steadily improving with each new film, Mickle’s best work yet premiered late last year: We Are What We Are, a superior remake of an underrated 2011 Mexican film about a family of cannibals, transplanted to rural Upstate New York in Mickle’s version and infused with religious undertones. Throughout Hollywood, Mickle’s name was abuzz, but everyone who’d meet with the Pennsylvania native, who’s in his mid-30s, couldn’t get past his horror leanings. As the film industry is prone to do, they pigeonholed him as nothing more than a fright film maker. 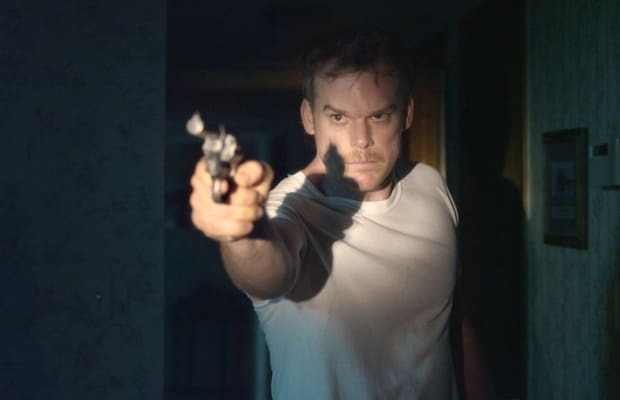 Michael C. Hall, though, saw something special in Jim Mickle, and the man formerly recognized as Dexter Morgan responded to a project that’s been Mickle’s passion target for almost seven years now: Cold in July (in limited theaters on available on VOD today), an adaptation of acclaimed genre fiction writer Joe R. Lansdale’s gritty, pulpy 1989 crime novel. After randomly meeting Mickle at the Sundance Film Festival in January 2013, Hall enthusiastically signed on to make Cold in July his first A.D. (After Dexter) look. The result is one of the most entertaining films you’re likely to see anytime soon. Fueled by a John-Carpenter-esque score, Cold in July is pure throwback bliss, channeling the man’s-man action films of the 1980s and twisting along with its unpredictable and corpse-riddled plot. Without giving anything away, here’s a brief set-up: Hall plays Richard Dane, a small-town East Texas husband and father who runs a rinky-dink picture frame shop; one night, an intruder breaks into his home, prompting the Richard to grab a handgun and, by accident, shoot the guy dead. He becomes a local hero, but his moment of glory doesn’t last long. The deceased intruder’s father, Ben Russell (Sam Shepard), is fresh out of prison and looking for bloody vengeance. From there, Cold in July’s narrative never goes where you expect it to, see-sawing between genres (from thriller to comedy, back to thriller again and touching upon horror, and so on) and giving Hall, Shepard, and a hilariously free-wheeling Don Johnson plenty of rich material. Having been a Jim Mickle fan since Mulberry Street, I must say, I didn’t see Cold in July’s genre-subverting excellence coming. It’s nothing like his previous movies, but, at the same time, it’s of a similar breed, never shying away from its brutality and including one of the most horrific images I’ve seen in a long time (presented via a grainy VHS transfer, no less, which makes it all the more unsettling). It’s a remarkable piece of midnight-dark entertainment. I recently had the chance to speak with both Jim Mickle and Michael C. Hall all about it; you’ll find both one-on-one interviews after the jump. And, hopefully, they’ll inspire you to take a break from those Memorial Day Weekend barbecues and pool parties to experience Cold in July firsthand.